We often get enquires about whether it’s possible for families to use the website and workaway. Whilst of course sometimes it can be more difficult to find a host (look for hosts who also have children) it’s by no means impossible. 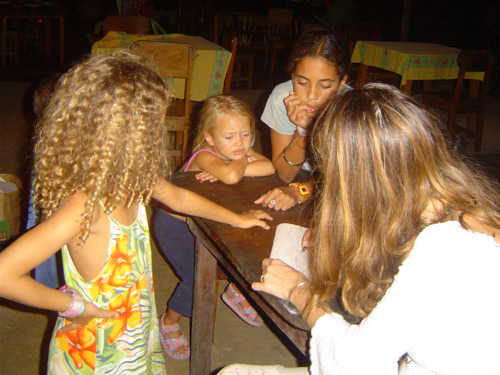 Many families have enjoyed and benefited from volunteering in all corners of the world. My partner and I decided that we wanted to spend the summer doing something really different. We had met travelling 15 years before, but since then we had put all our energies into building our own house in the country and bringing up our two kids. We missed travelling, but with young children the spontaneous “get up and go” mentality isn’t so easy. We looked into “workaway” and realized that this could be a good way for all of us to travel. The kids get tired and fed up if we spend too much time moving from place to place…as my son once reminded me, “Why do adults always want to travel around. We prefer to stay in one place, know where we are and not keep changing.” In many cases Workaway allows you to set up a home from home, to have a base from which you can really get to know a place and its people, and more importantly for the kids, to make friends. We looked at all the possibilities. At first it was hard because there are so so many great destinations and wonderful opportunities on offer, but then we decided to put the kids first. What would they really like? They are 7 and 4, so we wanted to choose somewhere that would have an impact on them…a memorable experience. So we curbed our focus away from historical monuments, spiritual havens, yachting trips and city life and eventually decided upon a tropical destination, vibrant colourful plants, animals and people! Costa Rica sounded perfect, it is full of natural parks, wildlife and conservation areas. There are arid zones, volcanoes, thermal springs and the Caribbean coast where we enquired about working. 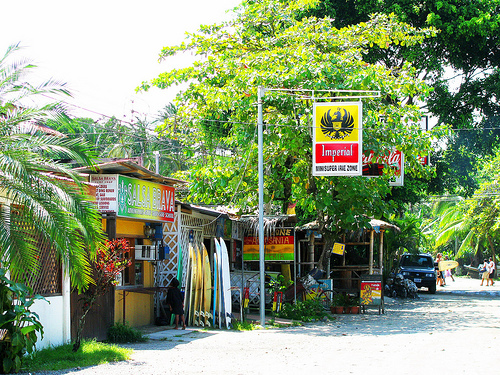 We soon received confirmation that help was needed at a beach lodge and bar near Puerto Viejo. Yippee! It was so easy…we had a plan…and a destination, and someone who was waiting for us on our arrival. Coming all the way from Europe, and changing flights in Florida, the journey was a long one for the kids. We brought plenty of games, gadgets and snacks with us to keep them entertained and of course half the time they were able to sleep. Knowing that we had a bed and a friendly welcome awaiting us was enough to keep us all motivated. It really worked for us to have a base. The kids soon adapted to their new home, found their way to and from the beach and to the local grocers shop. They made friends with the local kids and were sometimes invited out for the day by the tourists with children staying at the lodge. They also learnt to help out, whether it was picking bananas, doing a bit of gardening, helping to make lunch or doing small errands. I worked in the reception area of the lodge, whilst my partner tried out his carpentry skills by improving the beach bar. As far as giving the kids an opportunity to be impressed, we certainly succeeded and both of them have lasting memories of their time there. The highlights range from being kept awake at night by howler monkeys, watching enormous brightly coloured crabs scamper away with our washing, having a blue morpho butterfly resting on my daughter’s arm and seeing an enormous live tarantula caught by a neighbour and put in a jar! 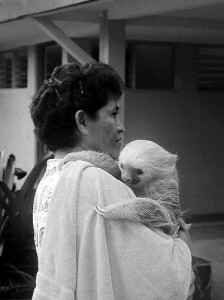 There are weird and wonderful creatures everywhere, from humming birds, brightly coloured frogs, exotic birds , raccoons which raided the kitchen at night like masked bandits and sloths which are huge but often loiter invisibly. My daughter was taken on an outing to a sloth sanctuary to see some of the casualties…those who had snoozed too deeply and consequently fallen out of the trees!! Having rice and kidney beans every morning for breakfast was a novelty for all of us. 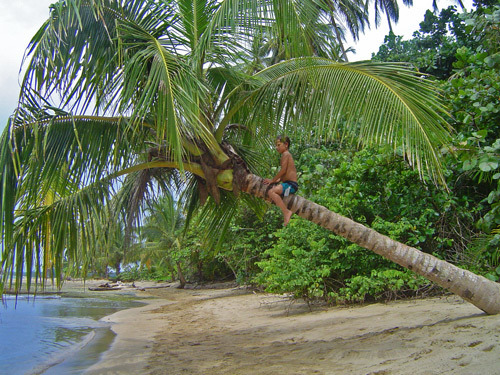 My son spent his days wandering round in red pants and climbing palm trees looking like Mowgli. My little daughter would be found at the hottest part of the day swinging in a hammock, her blond hair braided in corn-rows by one of the Columbian helpers who had taken a shine to her. I helped out at the local school, reading stories aloud in English and making pirate and princess outfits for a school party. My son even went along to the school as a visitor for the day. Like I said, we were all given opportunities which we would never had had, if we were tourists. From the lodge we also took time out to make a couple of trips. We became “tourists” for a change and did a road trip of central Costa Rica, and then a backpacking excursion to Panama. This is another great thing about workaway…you often have weekends free to explore, and you can also discuss the possibility of taking time out to make a trip with the view of returning some days later. This was one of the most fabulous journeys I have ever had, and we were able to share it with the kids…when under normal circumstances it may have proved too ambitious. They certainly wouldn’t have enjoyed it as much if we had been constantly on the move, looking for accommodation and a place to eat at every stop. Being a very economical way to travel we were able to afford a longer stay away…which made the 2 day journey there so much more worthwhile! hello, wow what a awesome story.. we also are looking to travel with kids..
if you could kindly pass on the details that would be awesome!! thank you!!! Sounds like a wonderful experience in Costa Rica. I want to travel with my son and was wondering if you can give me some tips on how to find an adequate host. For example, how long in advance did you start searching, what time of year did you go and how long did you stay for? We were there for July and August. It was the only time which fitted with work and schooling. We were originally concerned that it may coincide with bad weather, especially as it’s during the rainy season. However it mainly rained at night, and if it did rain during the day it was only short downpours which were quite refreshing and you just dried off in no time afterwards. 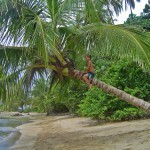 We started searching for hosts and flights after Christmas, and finalized the arrangements in March/beginning of April. Hope that helps! We heartily recommend to travel with your children, its the best experience and education on its own. Workaway has being a fantastic way to meet people, visit places and learn new skills that we will be using soon to build our own house and become self-sufficient!! I tried to find your blog but the server said it was down. I’d love to read your blog. My husband, 4 year old son, and I plan to start some world travel in late August 2015 and I’m really interested in doing some workaway adventures to make it more enriching for him. If your blog has been moved, please post the new address so the rest of us can learn from your experiences! HI great to read about families. We are a family host at the moment and would prefer families to join us on our boat travelling around the med, but have found them hard to find. Reading your story about Costa Rica made me feel maybe the winters here we could become the workers instead. Thanks for sharing!! I am new to workaway. I am a mother of two young children 9 & 5, whom I like to travelling around with. I am looking for families to share their experience with as well as to join to travel with. I have been looking for an opportunity to travel around with another family on a boat and here you are! :o) My husband and I have two little daughters and would love to talk anout the possibility. Please let me know details about your stay in Costa Rica and how to get in touch with this family. Thank you! We’ve passed along your request and you’ll hopefully hear from the family in the next few days. Thank you! I hope to hear from them soon! Wonderful Story! I definitely admire how you choose to raise your children. I am wondering if either you or Workaway would assist other families looking for a similar situation with tips on how to search for these opportunities. I’m very new to this site, but so far I’ve just been looking at host lists one by one. It’s fun…. but time consuming. And I haven’t found any hosts open to having families yet. Are there search words I can put in? Any help is appreciated as I’m just a little lost in all of this awesome info. Thank you!!! Try entering ‘families’ or ‘family’ into the search box on the host list page. This should be a good start for finding places that could be suitable. We are family of 5 and are looking for places to work and stay with when travelling around the world. Is it possible to bet contacts of the hosts un Costa Rica? We would advise looking for hosts there that also have children. Hi there, thank you for sharing your story with us. I am happy to hear that it worked out for you so well. I come from Germany and I live with my 10 year old daughter and I am in the process of looking for hosts in Hawaii. It is a long dreamt dream coming true for me that we will be going to hawaii in May till August. I found a place from workaway where we are wellcome but same conditions as two adults, which is either very work intensive or expensive. On the whoof.net homepage one can select hosts after the criteria if children are wellcome. Just my Destination is so popular that it is not so easy under these conditions – not in the best age anymore to do the hard work and with a child. And yet I am very excited and looking forward to our adventure and how this will work for us. I am looking into doing a year in another country with my husband and son, who will be 3 1/2 when we do it. We would have to work while living there, I would prefer a workaway type experience. Has anyone done an entire year with a program like this? We are also considering 6 months to a year with a 4 year old boy. Would love to hear from you both. Anyone have a blog we could follow? Hello,I am single mother with 2 boys 9and 6 year. I love travellin.Last year we went to Sardinia and we all fall in love in Sardinia. Me encantó la experiencia que habéis compartido. Me gustaría tener una parecida en Inglaterra, para éste verano. We are a family of 6.